BY MANUEL PEREZ-ROCHA, JULY 8, 2015 . 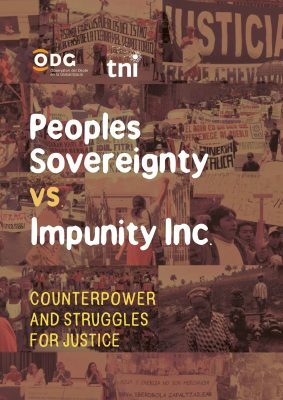 A new book from the Transnational Institute (TNI) includes the article “The Pacific Rim – Oceana Gold Case against El Salvador; impunity and violations of human rights, democracy and human rights”, written by IPS Associate Fellow Manuel Perez-Rocha. ​ Violations of human rights and the rights of peoples and nature have become inherent to transnational corporations’ operations and can only be equated with their growing economic and political power. What is more, these corporate violations have become systematic and corporations are certain of the impunity of their operations, which is becoming evident in an increasing number of areas of our lives, as corporations advance in the dispossession and appropriation of the commons. To confront all of this, popular resistance has become increasingly globalised and coordinated by linking up counterpowers opposing the most powerful corporations on the planet. “Peoples Sovereignty vs. Impunity Inc.: Counterpower and Struggles for Justice” presents, in eight articles, various cases that aim to serve as tools of action for activists from different continents to use in their fight for access to justice against the systematic violation of human rights and other crimes committed by transnational corporations. This publication has been produced in the framework of the Global Campaign to Dismantle Corporate Power and Stop Impunity. Its publication coincides with the first meeting of the “Open-ended intergovernmental working group on an international legally binding instrument on transnational corporations and other business enterprises with respect to human rights”, which is to be held in July 2015. The commencement of this group’s work constitutes a milestone in the history of the struggle against the impunity of transnational corporations. The social movements and organisations that build counterpower to transnational corporations on a daily basis remain alert and vigilant to this process.